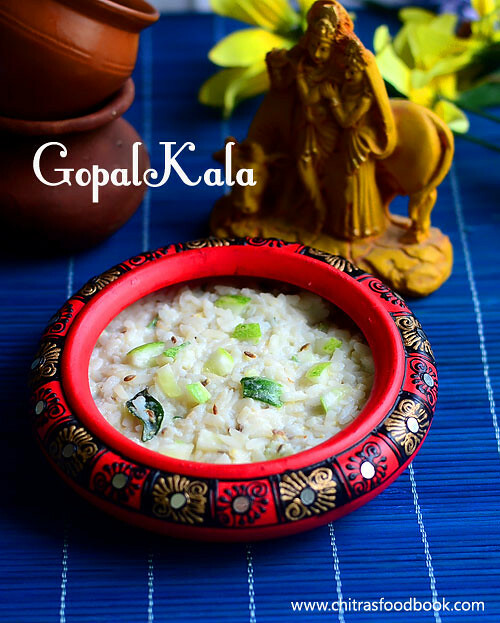 If you are looking for an easy Janmashtami recipe, Gopalkala is the best choice. It is a most popular dish prepared on the occasion of Janmashtami/Krishna jayanthi in North India. It is prepared in temples, offered to Lord Krishna and served as prasad during the festival for the devotees. When Lord Krishna was young, he used to mix all his Cowherd friend’s lunch recipes with his favorite curd, butter, milk, made this dish and served his friends. 'Gopal' is the name of Lord Sri Krishna. 'Kala' means the mixture. 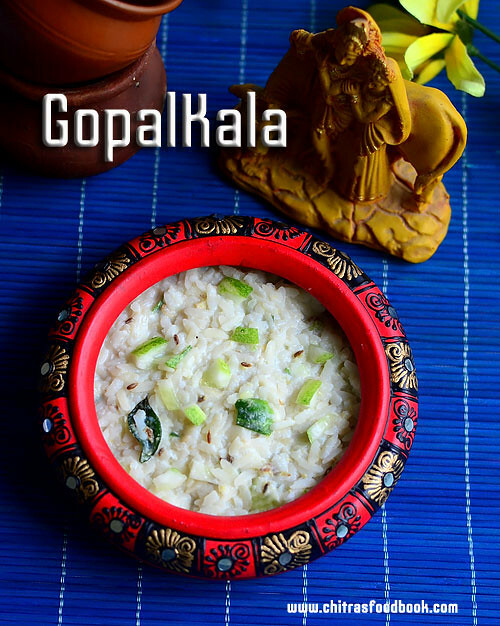 So this dish is named as Gopalkala. It is is a mix of beaten rice/ poha, curd,milk, ghee, green chilli, sugar, salt and cucumber.This is also called as Dahi poha. I followed the recipe from this space. There is no hard and fast rule to make this dish. This salty and sumptuous dish is prepared in every home in North India where the festival of Janmashtami is observed. It is extremely easy to prepare and hardly takes few minutes to prepare. Try this easy Janmashtami recipe and have a great celebration ! Wash the poha/Thick rice flakes twice or thrice. Remove all the debris. To this, add milk, curd, butter, salt and sugar. Mix well. Let it soak for few minutes.In a small kadai, heat ghee. Temper cumin seeds, green chilli, curry leaves and ginger pieces.Add this to the poha mix.Add finely chopped cucumber pieces. Mash the poha well and serve. It thickens over time. So add more curd, mix well and serve accordingly. Adding butter and milk is optional. You can add finely chopped guava and banana pieces too. Gopalkala thickens in time. So add more curd and mix while serving. 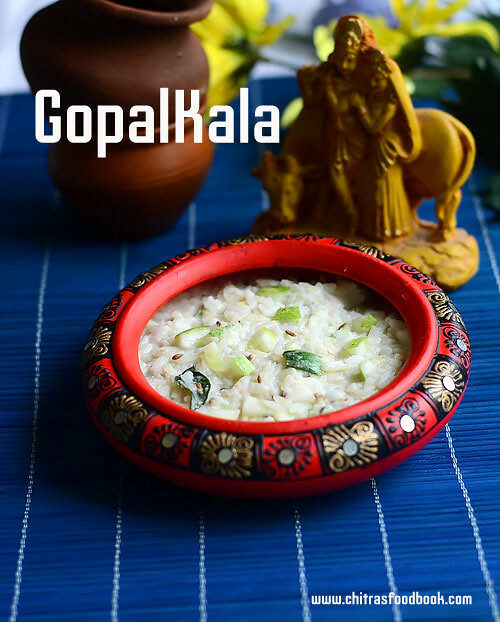 Easy, no cook Dahi Poha/Gopalkala is ready to offer to Lord Krishna ! Brings back memories from my childhood, yummy!